Generally the fifth week of Autumn marks the very start of peak fall foliage time at our elevation (2,300 feet above sea level). From October 20 through October 31, the ridges sparkle as the color makes its way like a slow-motion waterfall down from the higher elevations to our neck of the woods. 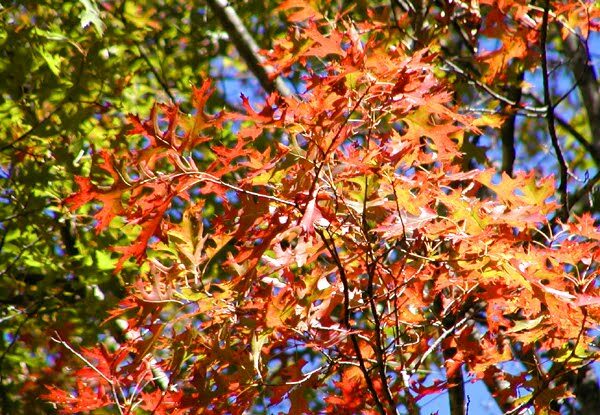 We’re lucky in that the mountains have several weeks of color in various places, easy to get to and worth driving to with the fall foliage providing perfect scenery for your drive. 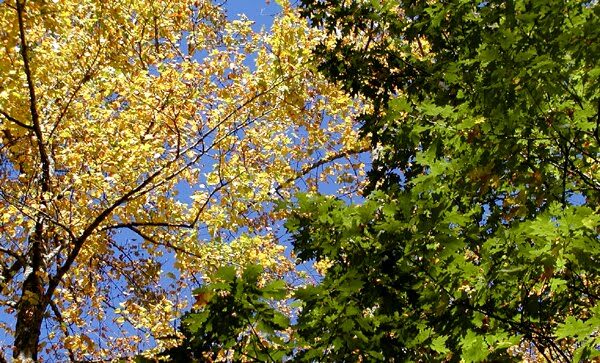 This fall, some spots at our elevation are peaking early or very quickly, while other places are still green or just beginning to show serious color. For example, the two ridges on either side of the Inn on Mill Creek, Bernard Ridge and Horse Ridge, have had completely different fall foliage patterns, with Bernard Ridge changing and dropping leaves much faster than Horse Ridge. The mountains of Western North Carolina have certainly had a unique year in terms of weather, and that shows in the fall foliage that we’re seeing now. Quite a mixed color palette this year! Several of our guests have remarked (and we agree!) 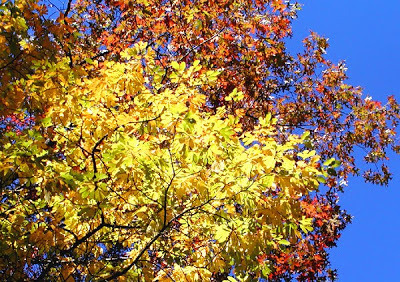 that the yellows in the fall color palette are particularly brilliant this year, represented mostly in our neck of the woods by hickory and birch. 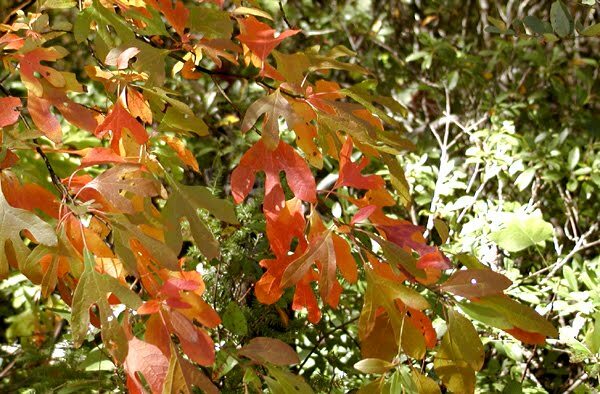 In our opinion, the oranges of sassafras, maples and early changing oaks are tending to be a bit darker than year’s past, and coupled with the yellows really bring a warm glow to the mountains. The maples in Pisgah National Forest around the Inn on Mill Creek are just starting to really show their stuff, with several maples having changed only at the furthest tips of the branches. They should look beautiful during the final week of October. 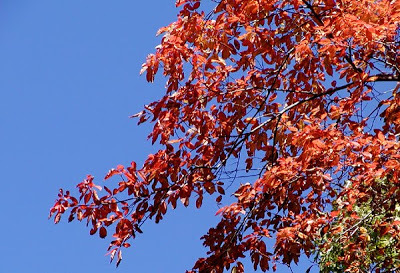 Rusty oranges and new reds join the already brick-colored sumac and sourwoods as maples and oaks start to turn. Our tulip poplars are hanging on, although this isn’t the best year for them. They’re doing much better than last year, providing some pretty yellows throughout the woods. North Carolina Arboretum — The North Carolina Arboretum has over 430 acres chock full of gardens and nature trails. It has a 360-degree view of the mountains surrounding the Arboretum, making it one of those perfect places for a walk among the fall foliage on a bright, sunny day (of which we have no shortage in the North Carolina mountains). Lake Tomahawk in Black Mountain, and Lake Susan in Montreat — Just a few minutes from the Inn are two very pretty lakes, with walking loops around them and picturesque views of the mountains. Lake Tomahawk in particular has stunning views of the Seven Sisters, a line of seven peaks that overlook the town of Black Mountain. Mt. 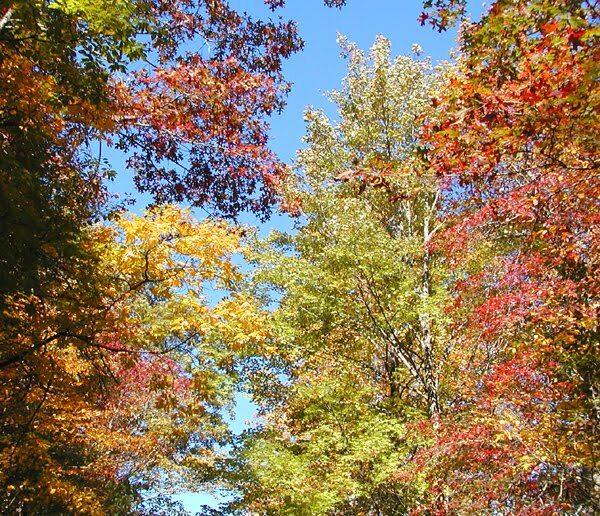 Pisgah — Heading south on the Blue Ridge Parkway out of Asheville, you’ll enjoy the fall foliage of Pisgah National Forest while making your way to Milepost 407.6. At the back of the parking lot is a 1.5-mile (one-way) hike to the summit of Mt. Pisgah. At more than 5,700 feet in elevation, you’ll catch some gorgeous views of the mountains. And just beyond the Mt. Pisgah trailhead is the Pisgah Inn, a fantastic place for lunch or dinner. Keep in mind, the Pisgah Inn closes at the end of October for the season. We’ll see you in a few days for Week 6! This entry was posted in Uncategorized and tagged Asheville, Autumn / fall foliage, Biltmore, Black Mountain, Montreat, NC Arboretum by Inn on Mill Creek. Bookmark the permalink.